Well yes; some of us have been saying this ever since the UK biomass thing really got going (click 'Drax' thread below). The science is easy, the conclusion a no-brainer. Then again, no-brain is exactly how the 'green' debate proceeds, as a glance at many of the CiF comments BTL under that story will confirm. At the same time, there are even more anti biomass comments there too - which wouldn't have been the case even a couple of years ago. 2017 probably marks the year the biomass issue turned around in public discourse. But what? I suppose the only real rationalisation could be: ... but someone (the 'experts', maybe?) ought to have listened on our behalf, and carefully considered the nutter's arguments, and told us to change our views. Ah yes, the experts. I think we know the fallacies in such an argument. Ho hum; that's the way of the world. You can get pretty cold and bitter, out there in the wilderness. 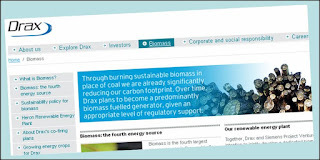 The 'carbon-neutral' biomass thing was always a demented view, given the lie by two centuries of science and technology: but it wasn't just a batty green opinion. No, it forms the basis of gigantic 'renewables' subsidies for woodpellet-burning electricity in the UK (almost £1 billion p.a.) which in turn has spawned a substantial new industry: the felling of tens of millions of trees a year in North America; conversion into wood pellets; shipping to northern England (we are the world's biggest wood pellet burners, oh yes); and storing / onward trucking thereafter to the powerplants. Several port authorities, and firms like Eddie Stobart, have become pretty well hooked on the trade; not to mention Drax and its smaller peers. 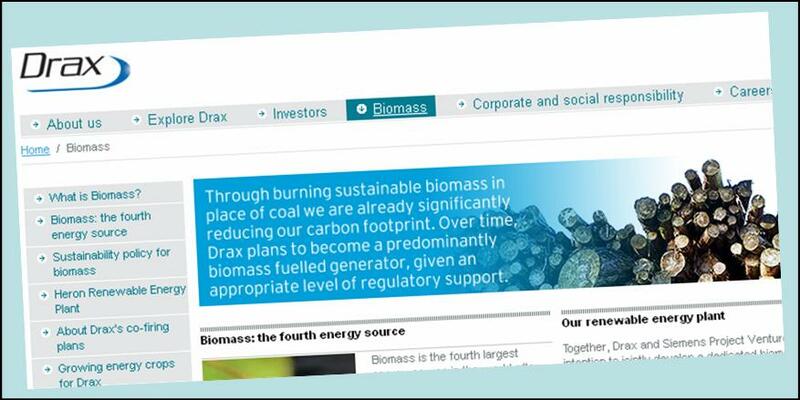 We've wondered before how long Drax plc - up to its eyebrows in biomass subsidies that must surely be in question - can survive when it becomes increasingly obvious the biomass game is up. To be fair, Drax has been diversifying as fast a big company can - which isn't particularly fast but it is fairly purposeful. They know the score. So Drax is still in trouble, long-term That graph may not yet have found the bottom. I agree the woodpellet scenario is crackers. Did anyone ever sit down and work out how much energy it would take to ship wood from the US and chop it up into pellets before burning it? It's the waste and pollutants I find abhorrent more than CO2; air quality has deteriorated since everyone installed woodburners. On a cold day you can smell it. Gas has to be the cleanest fuel apart from renewables. Please don't let them suggest burning plastic waste now that China (quite rightly) decided not to take ours any more. I hate to think of the nasties which would be generated by this. Given the farce with diesel emissions, just who are these "experts" the government uses. You'd almost think our elected politicians are self-serving pressure group fodder, lapping up any nonsense in the hope of a big payoff at the end. Excellent article. Surprised however no mention of a former member of the great & good, one Chris Huhne. Soon after his sentence for perverting the course of justice,he was appointed Europe manager of Zilkha Biomass Energy,the company making wood chip pellets in the USA, selling them as green energy around the world. Subsidies for wood pellets,have cost the UK taxpayer at least £400 million pounds in subsidised power stations burning American wood pellets. There is of course no suggestion (cough cough) that Huhne's work in sustainable energy has in any way been connected with his former position as UK energy and climate change secretary. Silly point but noticed that most churches have paraffin wax candles burning. I recall that the yellow flame is small carbon particles - is this same as the diesel particles? Also of course CO2 production. I listened to a C of E clergyman lecturing on climate change and air pollution. I can’t remember the last time I heard an effete C of E vicar talk about the gospel. They’re all just communist parasites as far as I can tell, more interested in Islam than Christianity. Anyhoo... if “climate change” was real (it isn’t, other than natural variability which has always been with us) the only suitable answer would be nuclear, the other possibility in the absence of fossil fuels being a return to the Neolithic. Climate change, did you say, Nick? Climate change is real. Increasing the amount of CO2 and Methane in the atmosphere must raise temperatures. This is basic physics. I agree with you that nuclear is the only practical solution. I think some Greens would prefer a return to the Neolithic. It is the dream of the "Noble Savage" and William Morris's mediaevalism. I suspect these people were bad at maths and science subjects at school. As for "global cooling for 2018" -- that's weather, not climate. Climate is the running average over ten or fifteen years, not one year.